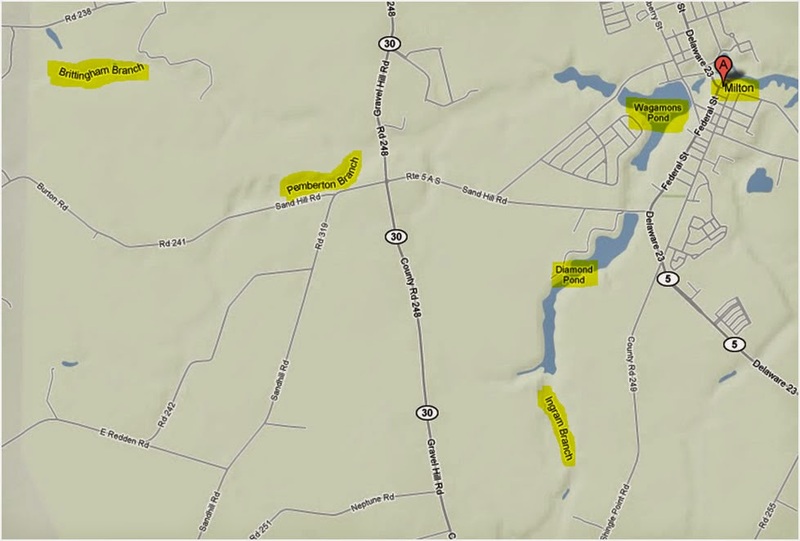 In trying to pinpoint the exact location of Robert Patterson’s 106 acre tract in Sussex Co DE, what details do we know? Let’s take a look at the deeds concerning this tract and see what we can glean from them. G7-030. 7 November 1732 Matthew Ozbon Jr. of Sussex County, Delaware to Robert Patterson yeoman, of same for 50 pounds, 106 acres on the South side of Pemberton’s Branch, one of the branches that runs into the Broadkill Creek below the county road. Tract was taken up and surveyed for Matthew Ozbon by commissioners warrant granted to Robert Lodge, carpenter of Sussex by proprietors in Philadelphia on 8 December 1718. Robert Lodge sold to Matthew Ozbon dated 2nd day 10th month of 1719. Land was surveyed by Matthew Ozbon and found to contain 212 acres of which half is sold to Robert Patterson. Bounded by Pemberton’s Branch, by a small branch below the county road. Witnesses: Phil. Russel, Robt. Shankland. Acknowledged: 7 February 1733. G7-032. 7 November 1732 Matthew Ozbon Jr. of Sussex County, Delaware to Thomas Black yeoman, of same for 15 pounds, 106 acres on the South side of Pemberton’s Branch, one of the branches that runs into the Broadkill Creek below the county road. Tract was taken up and surveyed for Matthew Ozbon by commissioners warrant granted to Robert Lodge, carpenter of Sussex by proprietors in Philadelphia on 8 December 1718. Robert Lodge sold to Matthew Ozbon dated 2nd day 10th month of 1719. Land was surveyed by Matthew Ozbon and found to contain 212 acres of which half is sold to Thomas Black. Bounded by Robert Patterson. Witnesses: Phil. Russel, Robt. Shankland. Acknowledged: 7 February 1733. JONATHAN LEWIS m. Mary Brice, 9 Apr 1760. Mary was widow of James Brice and dau. of Thomas Black. On 16 Feb 1763 Orphans' Court recorded the inventory of the estate of James Brice, filed by Jonathan Lewis who m. Mary admx. of James Brice. . . . Petition to sell land in Broad Kill Hundred. On 31 Jan 1763 Jonathan Lewis and his wife Mary, Elias Mason and his wife Sarah for (pounds) 75 sold to John Clowes, Jr., merchant, 2 tracts on s. side of Pemberton's Branch, one of which was granted by virtue of a warrant to Robert Lodge and he assigned over his right thereof to Matthew Ozburn, Jr., for whom it was conveyed. The southern 1/2 part of the tract on 7 Nov 1732 became the right of Thomas Black and he d. intestate and the land became the right of Mary and Sarah, daus and only surviving heirs of afsd. Thomas Black, 106 a.; the other tract was granted to Agness Black, sister to afsd. Mary and Sarah by virtue of a warrant adj. afsd. tract and the said Agness d. without issue and the land became the right of the afsd. Mary and Sarah. First of all, we can determine that the southern boundary line of Patterson’s tract was described as the “dividing line”. What did it divide? It doesn’t specifically say. However, we see from the legacy of Thomas Black’s half of the original 212 acre tract, that Black’s land was the “southern half” of the divided tract. This suggests the “dividing line” was the line that divided the 212 acre tract in half, with Patterson to the north and Black to the south. 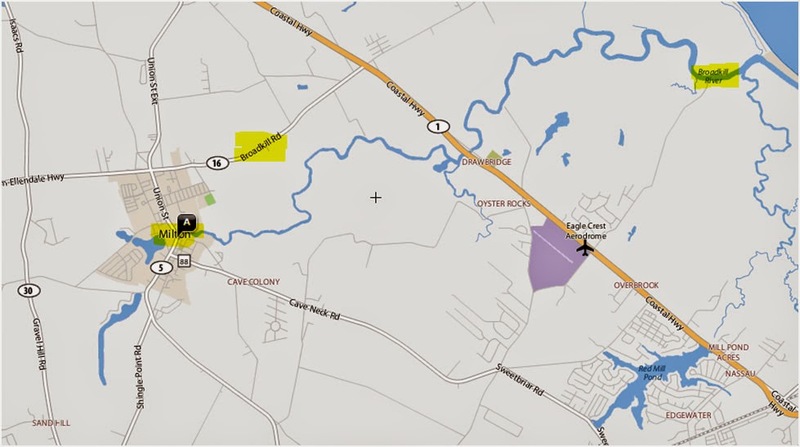 The following map highlights the town of Milton, DE. 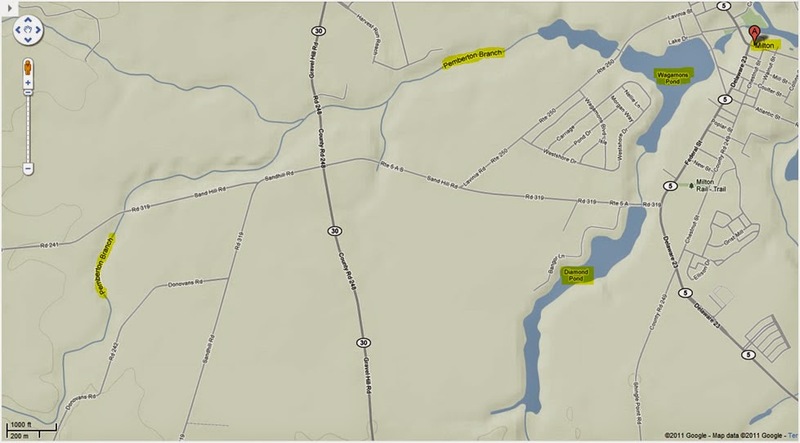 We can see that the Broadkill River flows from west to east directly through the town of Milton and dumps into the Delaware River a few miles to the east. This map was captured using Yahoo maps. All of the following maps may be clicked on to see a larger version of it. The following map was captured using Google maps in Terrain mode. This tool allows us to see the waterways better, as they flow east to the town of Milton. We can see that the larger body of water just to the west of Milton is called Wagamons Pond, fed by streams from the west and south. Pemberton Branch is the main branch coming from the west and is the branch we are most interested in. The following map is the same but zoomed out further to see the names of the various branches better, such as Brittingham Branch to the west. We now know that’s the one that flows into Pemberton Branch in the previous map. Likewise, we can see that Ingrams Branch flows north into Diamond Pond which in turn feeds into Wagamons Pond from the south. The following map is captured from Google Maps but in Traffic mode instead of Terrain mode. The benefit of this mode is that at certain zoom levels we can see tract boundaries. Now we know they are modern tract boundaries, but in some cases the boundaries are still similar to that of two or three centuries ago. So occasionally we can get lucky and see meaningful patterns. That’s where the program DeedMapper comes in. If you have previously mapped out the metes and bounds of a tract of land using DeedMapper, you will know the shape of the tract you are looking for. Before we go any further on that subject though, look at the following map and notice the numbered markings. 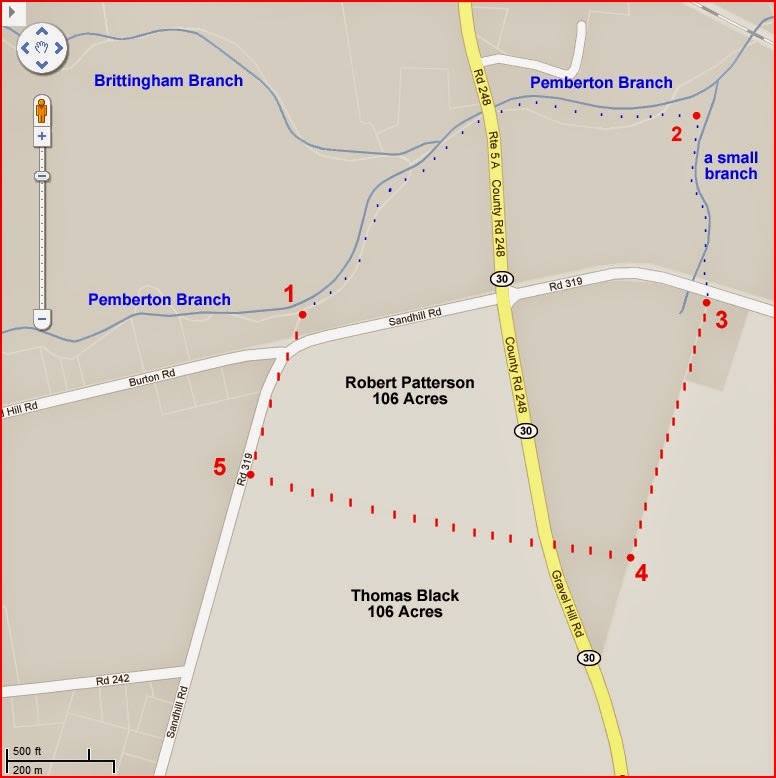 Patterson’s tract had five corners, three of which involved a branch. #1 denotes the “corner white oak Pemberton’s Branch”. Then going NE (N75E 167P) “down the sd branch on the several courses”. This means that going NE “down” the branch – down stream – in other words EAST. When a line follows the course of the branch it is not a straight line. However, the next corner it goes to if drawn in a straight line would be North 75 degrees East. That means face due north, then rotate to the right or east 75 degrees. The distance was 167 poles (one pole = 16.5 feet) or 2755.5 feet. That would be the right distance to corner #2 in the above map. #2 denotes a “corner red oak sapling standing on the sd branch on the west side of the mouth of a small branch”. First notice it doesn’t say Pemberton Branch, but rather a small branch. The head of this small branch begins at #3 just below the road and flows north to #2 where its mouth is at Pemberton Branch. So on the west side of the mouth is where corner #2 is located. The next line then follows the small branch “up the sd branch on the several courses”. It goes “up” the branch – in other words, south. It goes to corner #3 which is located S12W 48P (792 feet). #3 denotes a “corner white oak standing on the SE side of the sd branch below the road”. This corner is on the SE side of the small branch and “below” the road, or south of the road – Sand Hill Road, that is. Take a look at the following image of the tract from DeedMapper. Remember the blue lines are the waterways and simply denote the straight path from corner #1 to #2 and from #2 to #3, but in fact the boundaries of the tract were not straight on those blue lines, but rather followed the course of the branches. Notice the following map, same as previous Google map but zoomed closer. The angle of the modern tract below corner #3 runs SW at the same angle as the DeedMapper image. Same goes for the western boundary of the tract that no doubt followed the line that is now Sandhill Rd running SW from corner #1. Also notice the faint white line running SW from corner #3, separating the two darker sections. This signifies a separation of tracts. This matches how Patterson’s tract should have looked. Furthermore, Patterson’s line from corner #3 running SW to corner #4 was 110.5 Poles or 1823.25 feet. 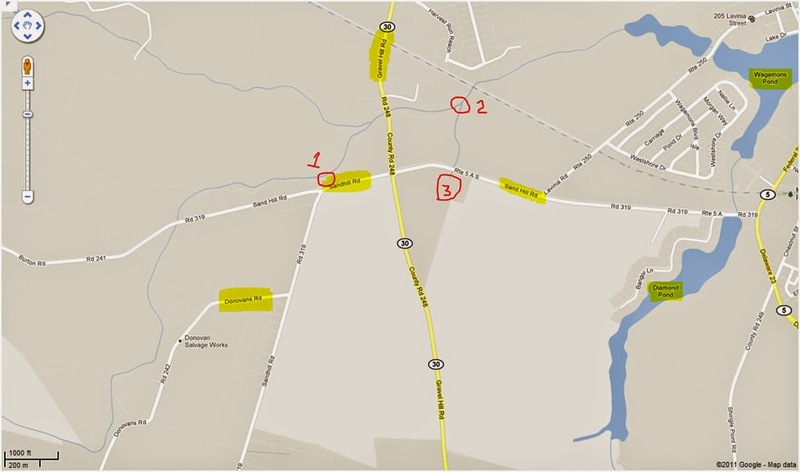 Corner #4 would have terminated near Gravel Hill Rd. Corner #5 would have been along the Sandhill Rd about the point where you see “Rd 319” on the following map. Basically, it appears to me that the modern road (yellow road in previous map) called County Rd 248 or Gravel Hill Rd or Hwy 30 runs south crossing onto the northern line of Patterson’s old tract and leaves his tract at or around the SE corner of it. So here is a blend of two mapping programs (Yahoo and Google) and multiple modes in each (Traffic and Terrain), plus the DeedMapper program working together to help pinpoint on modern maps the specific location of a tract of land from almost 300 years ago.